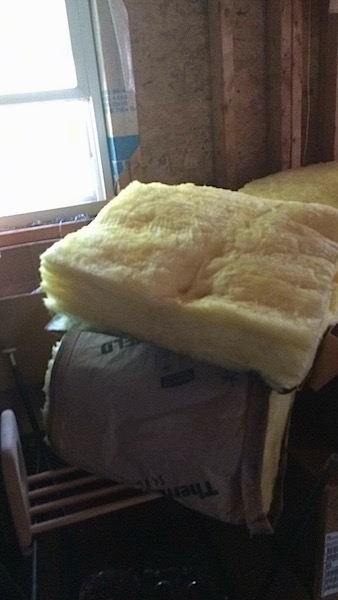 People often frivolously use fiberglass insulation without giving any thought of how harmful it can be when misused. Here it is being used as a padding to prevent someone from bumping their head on a bracket that sticks out. 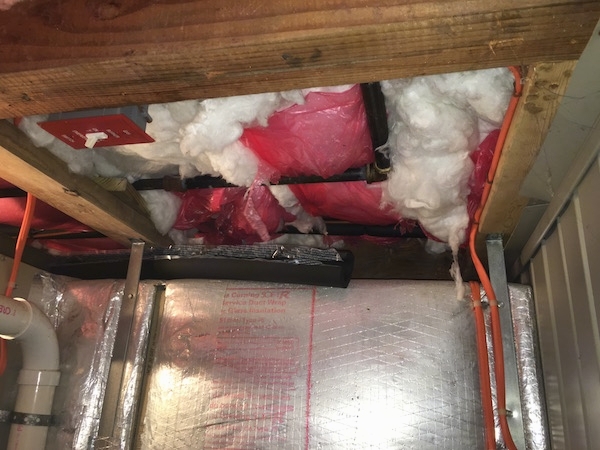 The insulation is not sealed in any way. Its just wrapped on there like cotton. This is fiberglass insulation lining the ceiling of a house located at a beach. The house itself is on pylons, so there is no basement. Two rooms were built around the lower level covering the pylons, a laundry room and a storage room, along with a parking area. 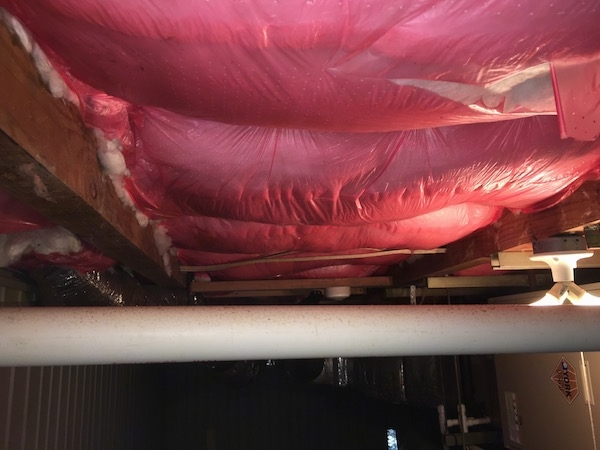 The insulation in the ceiling was getting into the air, not only inside the home especially when the HVAC system would come on, but the surrounding area outside through air vents in the lower level. Cars that were parked under the house would get the fiberglass particles inside of them. If one was sitting on the deck or walking around the outside of the house they were breathing it in. It gets very humid on the coast and when you mix water with fiberglass it breaks down even faster. 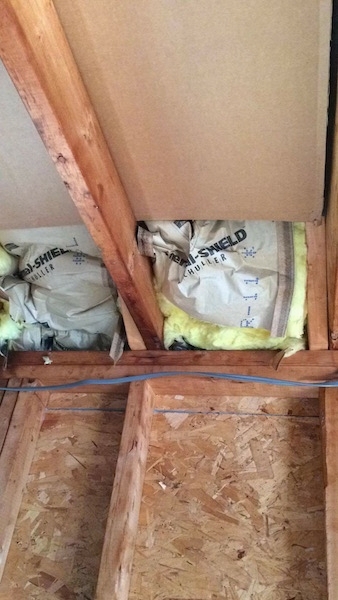 This is common for raised beach houses to have the floors lined with fiberglass insulation. The humid conditions at the beach make it unsuitable for exposed fiberglass. Fiberglass lining the ceiling at a house located on a beach. 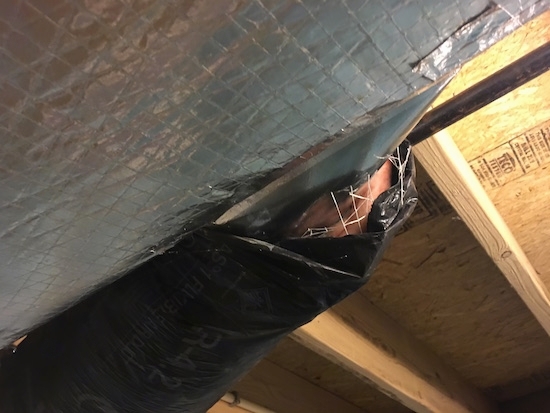 This is a HVAC air duct in a basement. It is wrapped in fiberglass with the end exposing the insulation to the air. 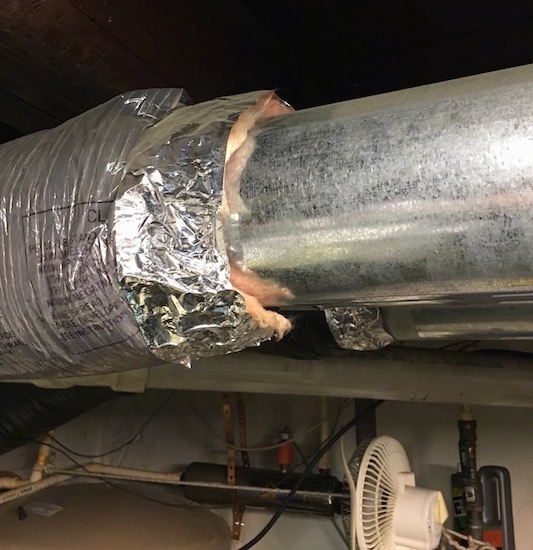 The homeowner wrapped the exposed end with duct tape to seal in any chances of small particles becoming airborne into the house. 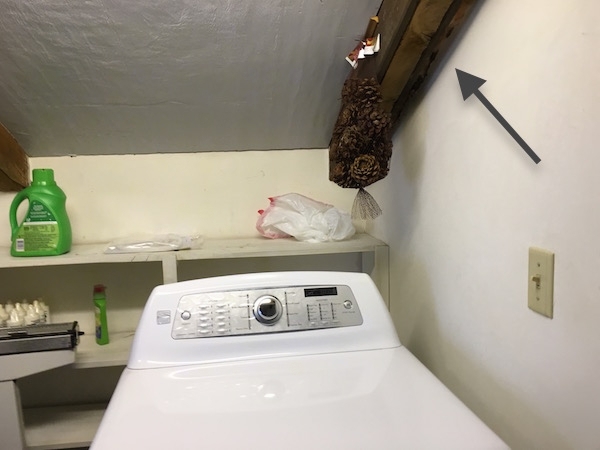 This is a laundry room of a home. Notice how someone shoved exposed fiberglass in a crack in the wall. The insulation is not sealed and therefore can easily become airborne in the form of small particles to which the humans breathe in. 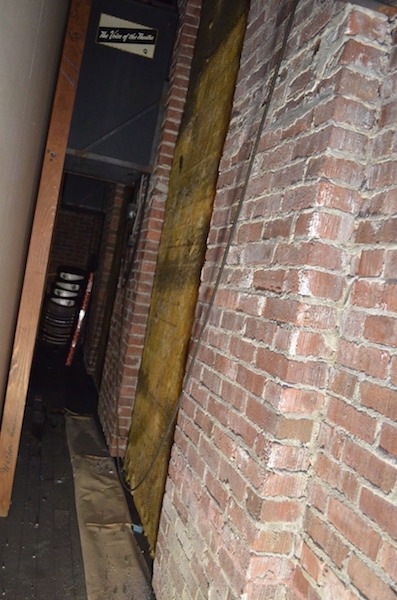 A closer view of the same laundry room showing the fiberglass in a crack between the wall and the beam exposed to the air. 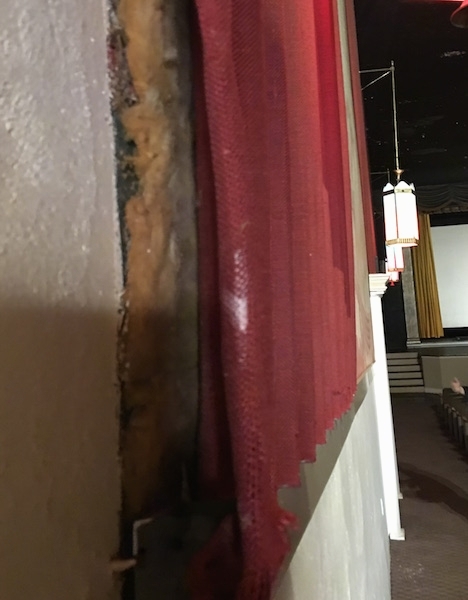 This is a movie theater behind the screen with exposed fiberglass insulation hanging on the wall being used as a sound barrier. 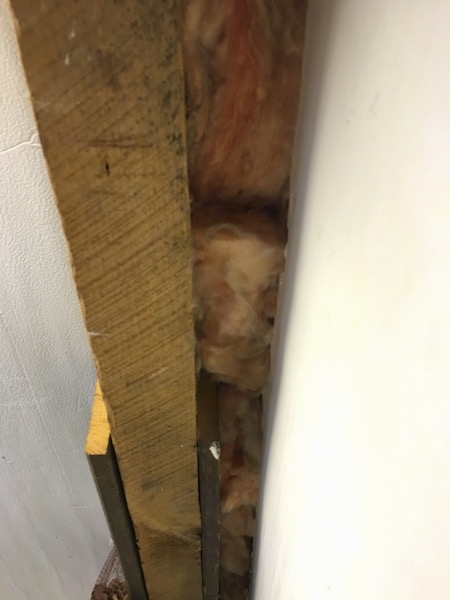 Notice the mold growing on the insulation. 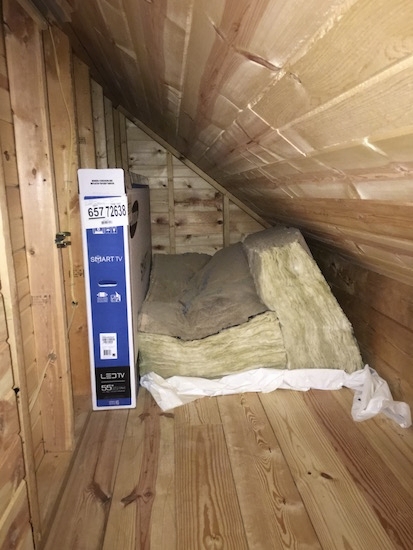 This is a movie theater with fiberglass insulation hanging on the walls next to the seats with fabric covering it, being used for sound control. This picture shows how fiberglass insulation is above the ceiling in a theater near the control room. The insulation is very old and is deteriorating, becoming airborne, especially when there is a shift in the air inside the building. Old insulation above the ceiling up in the control room in a movie theater around the conduit. When fiberglass gets this worn it falls apart and becomes airborne very easily. Two large pieces of fiberglass left in the crawl space of a log cabin style house. They were left by the builders and not discovered for a couple of years. 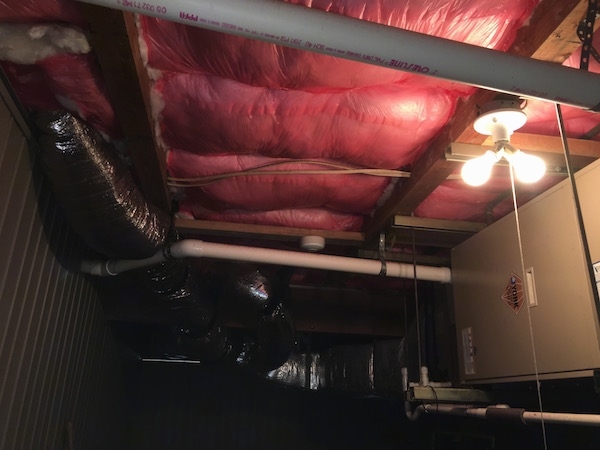 The flex duct work in a finished log cabin style house down in the basement. 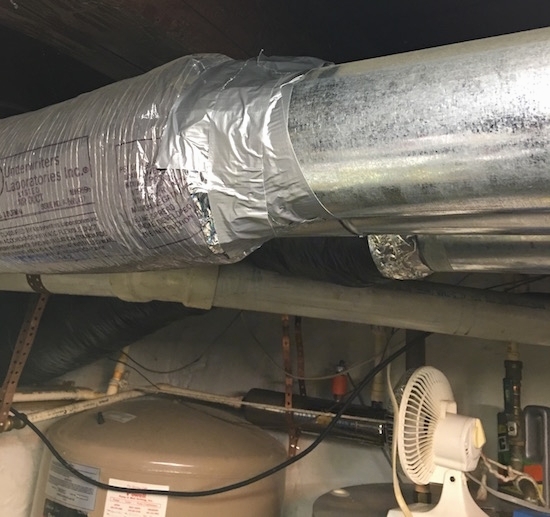 Notice how the builders did not use duct tape to seal off the exposed end. 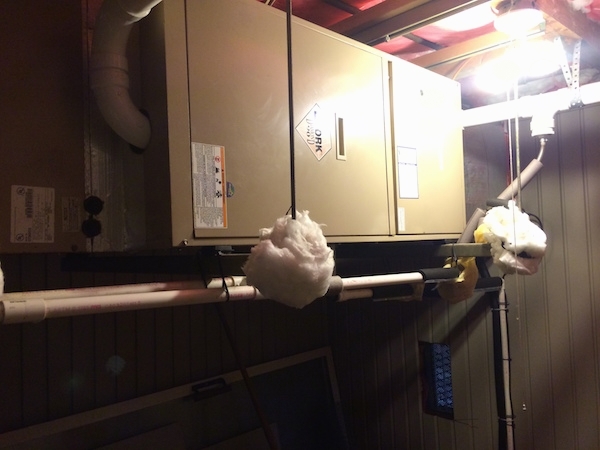 Not even the HVAC workers thought about airborne fiberglass. It may not happen in the first year of the duct's life, but it certainly will at some point become airborne as the air blows past it. If you are getting a home built, make sure your builders have the indoor air quality of the home in mind. 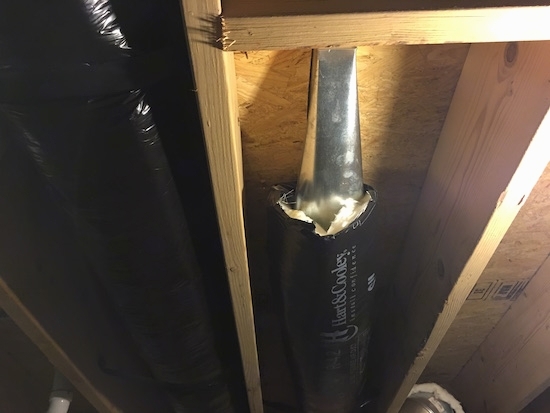 It is also wise to check your existing home's ducts to ensure all of the fiberglass is properly taped off to prevent your family from breathing in the small, fine glass particles. The same log cabin style home with more exposed fiberglass in the duct work. 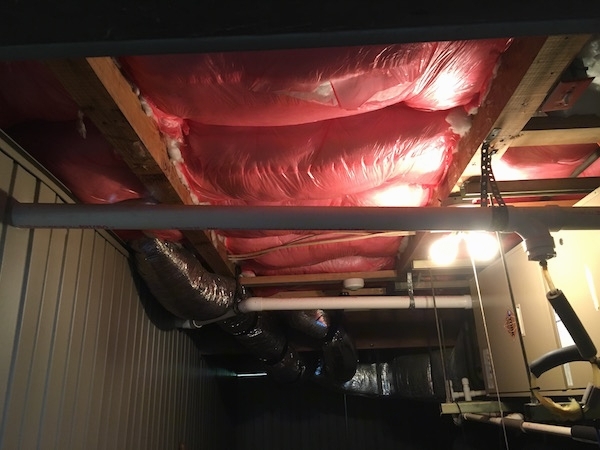 Those ends should have been duct taped off to ensure the insulation does not become airborne. 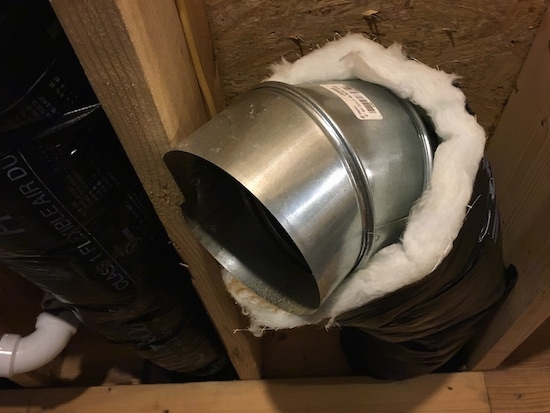 More ducts in the log cabin style home with exposed fiberglass. This is the ceiling in a fourier entryway to a house that was built in the 1970s. The ceiling is made from wood with wooden beams and wooden walls. There is a box built around a pipe next to one of the beams. A mouse made a nest inside the box using fiberglass. 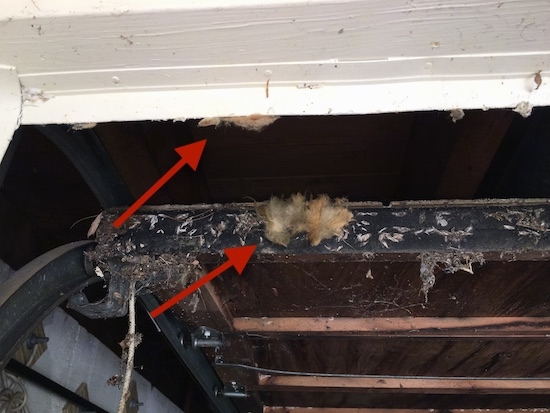 I am not sure if the fiberglass was placed in the box by the builder or if the mouse brought it to the box to make the nest. 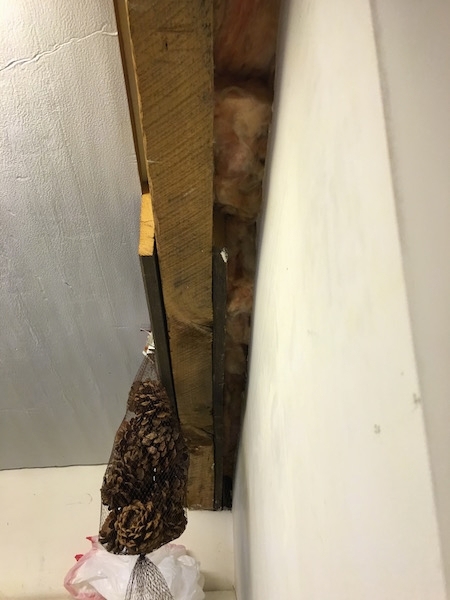 The insulation has been there for years. While mouse traps were put out to kill the mouse, no one thought twice about the exposed fiberglass that became airborn. 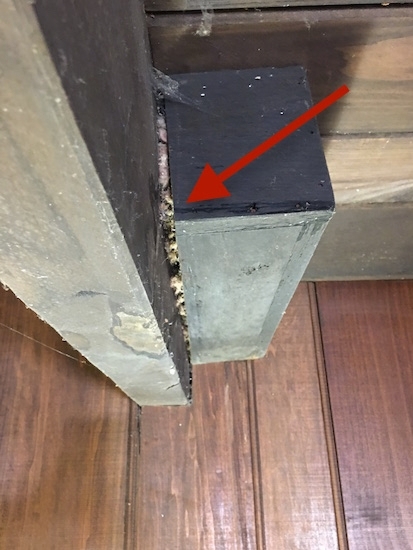 In the same room on the other side we see fiberglass insulation shoved in a crack between the wooden beam and the wooden paneling of the wall. This was not done by a mouse, but rather purposely put there in an effort to conserve energy 40 years prior. This is down in the garage in a house built in the 1970s. Fiberglass was shoved in all of the cracks in an effort to save energy and in return the stuff is everywhere. Here it is falling out of the space above the garage door and sticking to the bottom of the door. 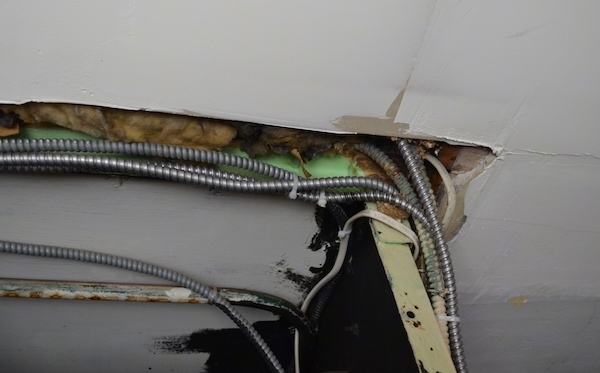 I do not think the fiberglass manufacturers intended for it to be exposed in every little crack of a home where it not only becomes airborn, but children and pets can get to it. There is little effort to educate people on its proper uses. Fiberglass also does not last forever. The older it gets, and the more it is disturbed, the more it breaks down and floats around the air we breathe. Fiberglass in a garage at a home from an unfinished project on the 'To Do' list for over 10 years. Meanwhile the fiberglass sits exposed to the air. Fiberglass batts in the garage sitting off to the side for over 10 years awaiting installation.